Modeling a part in the context of surrounding parts is a powerful way to design top-down. 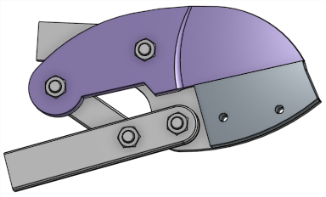 Onshape provides two methods of designing parts top-down. Each method has its own strengths, so you might want to use different methods for different designing scenarios. 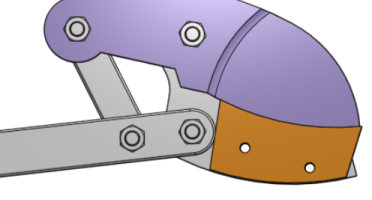 Use Onshape multi-part Part Studios when you have a strong understanding of your design intent at the start of your design process, and you want to use the power of a single parametric history to drive several inter-related parts. Use In-Context modeling (explained in this topic) when you need relationships between parts that were created in separate Part Studios, or even in different (linked) documents, or when geometric relationships are dependent on assembly position. This often occurs when your Assembly already exists and you need to make some in-context tweaks to one of the parts. This approach also scales well to large assemblies, when it's not feasible to have one parametric history drive all the parts. In addition to editing existing parts, you are also able to create an entirely new part in-context using the Create Part Studio in context tool. The Edit in context command is initiated in an Assembly. Select the part you wish to edit, and access the command from the context menu. When editing In Context, you are able to make as many references as you’d like to any of the parts in the assembly – safe in the knowledge that those references will never be lost or broken, so your part will never fail. You are also able to create multiple Contexts of the same Assembly in various articulated positions and update a Context, manually, in the Part Studio or Assembly if desired. Updates are never automatic; you control if and when to update and what to update through the Update context command. This prevents accidental changes to in-context parts that might occur as a result of moving or redefining other parts in the Assembly. In the Assembly, right-click the part you want to edit (called a primary instance), then select Edit in context to open the Part Studio containing that part. The assembled parts are visualized in the Part Studio (ghosted) around the primary instance in the same spacial relationship as in the Assembly. In addition, all parts originally in the Part Studio are displayed, opaque, placed as they were created. Return to the Assembly (click Go to assembly) and see the edits there. If the design intent was clear at the outset, all the parts could have been designed in a single Part Studio. This example assumes the assembly had already been built with parts from different Part Studios, so Edit in context is the best option. You have the ability to create a new Part Studio using the present Context of the Assembly with the Create Part Studio in Context Assembly tool. In an Assembly, insert parts and position them as desired by adding Mates and relations, or by using the triad manipulator. The Part Studio containing the selected part opens with the entire Assembly visualized in a ghosted state. Be aware that you can repeat these steps and create many Contexts of an Assembly in the same Part Studio as well as switch between them, so be sure to rename the Context with a meaningful name. Click Go to assembly at the top of the Graphics area. Select the Assembly tab at the bottom of the window. Right-click in the empty space and select Go to assembly. Note the edits are visible in the Assembly. You are able to turn off a Context to make unrelated edits at any time by selecting None in the Assembly contexts list above the Feature list. Parts created without referencing the part being edited in-context are not automatically inserted into the Assembly. Best practice is to rename a Context immediately with a meaningful name; many Context objects can be created for a single Part Studio. To edit in context and select an existing Context: open the context menu, select the name of the existing Context you wish to edit and select "Edit in context." Once you have created a Context, you can make changes either in the Part Studio or in the Assembly and choose to update that Context in the Part Studio if you wish. This enables you to work in a Context in the Part Studio and not affect your Assembly unless you want to update your Assembly with the changes. The same is true for changing the Context from within an Assembly. You can make changes to the Assembly, then switch to the Part Studio and update the Context there to view the changes if you wish. Updates are never applied automatically. Since it's possible to have multiple Contexts in one Part Studio, this example shows a Part Studio with two Contexts: one that references a ball valve in the closed position, and another that references the ball valve in the open position. A stop is modeled in each Context, so the final design has a stop for the open position and the closed position. The primary instance is created when you edit a part in-context and is indicated by a solid arrow beside the feature in the Feature list (in the Part Studio) and beside the part in the Instance list (in the Assembly). The primary instance defines the anchor part (the part selected for the Edit in context command) for the placement of the ghosted assembly in the Part Studio; all other assembly components appear in the Part Studio in relationship to that primary instance. In the Assembly, select a part. Right-click to access the menu, and select <context name> > Set as primary instance. The new primary instance is marked with a solid arrow in the Parts list, and the previous primary instance (if present) is marked with a dashed arrow . Context objects are given a default name when they are created. To avoid confusion, rename each Context with meaningful names as it is created. In the Assembly Contexts list (located above the Feature list), select the Context from the dropdown. Click the that becomes active when the Context name is selected. Type a new name and press Enter or click . In the dialog, select the specific workspace (Main or B2, in this case) in which to edit in context. Use this command when you want to end an edit in context session and return to the Part Studio without a Context and without creating a Context object. When editing in context, you are able to make as many references as you'd like to any of the parts in the assembly - safe in the knowledge that those references will never be lost or broken, so your part will never fail. 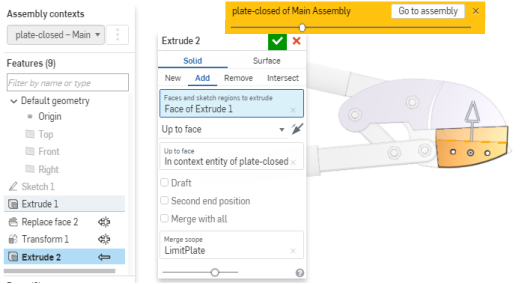 You are also able to create multiple Contexts of the same Assembly in various articulated positions and update a Context, manually, in the Part Studio or Assembly if desired. Updates are never automatic; you control if, when, and what to update through the Update context command. This prevents accidental changes to in-context parts that might occur as a result of moving or redefining other parts in the Assembly. In the Assembly, select Edit in context from the context menu of the part you want to edit. The Part Studio containing that part opens. The assembled parts are visualized in the Part Studio (ghosted) around the primary instance in the same spacial relationship as in the Assembly. In addition, all parts originally in the Part Studio are displayed, opaque, placed as they were created. Extrude up to face, using the blade as a reference point for the Extrude feature. Return to the Assembly (tap Go to assembly) and see the edits there. If the design intent was clear at the outset, all the parts could have been designed in a single Part Studio. This example assume the assembly had already been built with parts from different Part Studios, so Edit in context is the best option. Double-tap on a part to use as the reference point (primary instance) and select Edit in context from the context menu. Be aware that you are able to repeat these steps and create many Contexts of an Assembly in the same Part Studio as well as switch between them, so be sure the rename the Context with a meaningful name. Tap Go to assembly at the top of the Graphics area. Once you have created a Context, you are able to make changes either in the Part Studio or in the Assembly and choose to update that Context in the Part Studio if you wish. This enables you to work in a Context in the Part Studio and not affect your Assembly unless you want to update your Assembly with the changes. The same is true for changing the Context from within an Assembly. You have the ability to make changes to the Assembly, then switch to the Part Studio and update the Context there to view the changes if you wish. Updates are never applied automatically. 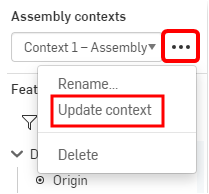 To update a Context in an Assembly: Select the part edited in-context, access the context menu and select Update context. To update a Context in a Part Studio: Select the Context in the Assembly Context list, tap the vertical-dot menu and select Update context. Open the context menu and select the Context and then Set as primary instance. The new primary instance is marked with a solid arrow in the Parts list, and the previous primary instance (if present) is marked with a dashed arrow. Tap the vertical-dot menu that becomes active when the Context name is selected. Type a new name and tap the checkmark. Tap the x in the gold banner at the top of the graphics area. 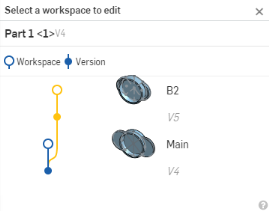 When working in one workspace and inserting a part from a version, when you select to Edit in context, the Select a workspace to edit dialog opens (since you are not able to edit the part in an immutable version). This allows you to select the specific workspace in which to edit the part. When editing in context, you can make as many references as you'd like to any of the parts in the assembly - safe in the knowledge that those references will never be lost or broken, so your part will never fail. Once you have created a Context, you are able to make changes either in the Part Studio or in the Assembly and choose to update that Context in the Part Studio if you wish. This enables you to work in a Context in the Part Studio and not affect your Assembly unless you want to update your Assembly with the changes. The same is true for changing the Context from within an Assembly. You are able to make changes to the Assembly, then switch to the Part Studio and update the Context there to view the changes if you wish. Updates are never applied automatically. When working in one workspace and inserting a part from a version, when you select to Edit in context, the Select a workspace to edit dialog opens (since you are unable to edit the part in an immutable version). This allows you to select the specific workspace in which to edit the part.